This Summer, Callum Innes will unveil his first public art commission as part of the Edinburgh Art Festival 2012. The Regent Bridge was designed by Archibald Elliot in 1814 to create an entrance to Edinburgh where London Road entered the New Town. It was constructed under the direction of Robert Stevenson and completed in 1819, thus solving the problem of entering the city through narrow and inconvenient medieval streets. Although still a major thoroughfare between the Old and New Towns, centuries of dirt and a lack of light have made the bridge feel more like a dark tunnel than a celebratory arch. Working with architect and lighting artist Gavin Fraser, Innes has evolved a scheme that will transform the flat sides of the lower arch at street level to create an illuminated path of floating colour. The work follows a series of set rules to create a structured and yet deliberately random order of coloured light, revealing and lifting the giant arch above. 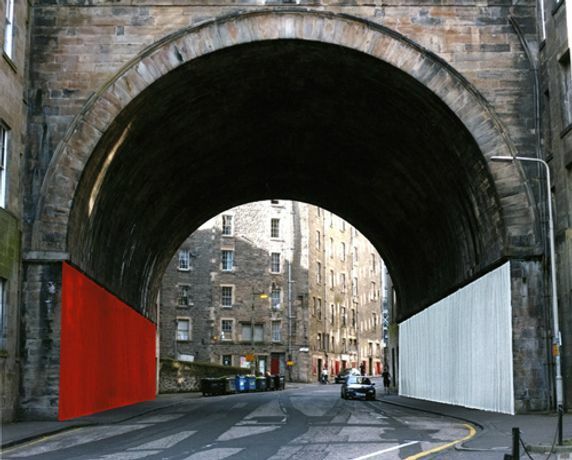 The Regent Bridge is commissioned by Edinburgh Art Festival and Ingleby Gallery. The commission is also supported by Edinburgh World Heritage and Baillie Gifford.